Allegany State Park - How Do You Think? The word awesome, in my opinion, is overused. There are rare moments, however, that truly inspire a response worthy of the word. It is easy to take for granted such moments and assume that they will happen again. I have found that appreciating such moments, as they are happening, enhances the wonder and makes them all the more meaningful. 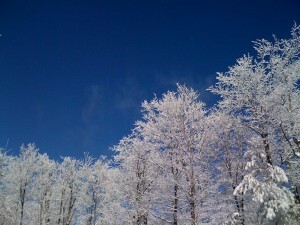 I experienced one of those moments on Saturday 1/9/10 at Allegany State Park. Driving into the park, ascending the winding tree lined road to the Summit is often quite beautiful. On this particular day, the jubilant anticipation of skiing was far surpassed by the shear splendor of what unfolded before my eyes. It had snowed the night before and all the trees above 2000 feet were completely encased with silky white snow. What made it all the more spectacular was the backdrop of the cloudless sapphire blue sky. The depth of color was reminiscent of the blue I had only previously witnessed at high altitude in the Rocky Mountains. It was truly awesome! The entire cross country ski trail system wound its way through this magical zone. I cherish this memory – it was time very well spent.